When my son Dan’s obsessive-compulsive disorder was severe, he was so imprisoned by the disorder he could barely function. Not surprisingly, he was also depressed. Typically a mild-mannered young man, he would occasionally snap at me if I annoyed him or refused to enable him. These episodes were infrequent, and throughout his illness, Dan remained remarkably even-keeled. A good number of people with OCD experience intense bouts of anger, or rage. While there aren’t a lot of statistics available, this study concludes that fifty percent of patients with OCD experience “anger attacks.” Not only can this be upsetting for the person experiencing rage, it can also be frightening for loved ones witnessing this potentially violent behavior. Rage in those with OCD can occur at any age, from young children to older adults. For those who have even a basic knowledge of OCD, it’s not difficult to understand (at least to some degree) where this rage might come from. For one thing, those with untreated OCD are compelled to perform compulsions to keep their world (and possibly everyone around them) safe, and if these compulsions are interrupted or hampered in any way, it can feel equivalent to letting someone die. These feelings are real, and they can be intense enough to propel the person with OCD into panic mode – and then rage. So what do we do when our loved ones with OCD experience rage? First and foremost, everyone in the home has the right to feel safe – and this is unlikely if you live with someone who regularly flies into a rage. The person with OCD should be working with a therapist who uses ERP therapy to treat obsessive-compulsive disorder and can also help your loved one better manage his or her emotions. In most cases once the OCD is under control, the rage will disappear. If the person with OCD is an adult who is refusing to get help, you might want to consider creating a contract. 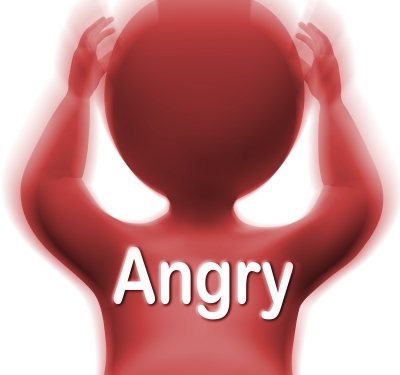 A rage can involve screaming, hitting, biting, throwing things, and attacking oneself or others. If it ever escalates to the point where you fear for your safety or the safety of your loved ones, you should reach out immediately for help. You can call 911 and make it clear you are dealing with a medical emergency, so that the person with OCD is brought to a hospital, and not to the police station. This is something that nobody ever wants to do, but unfortunately is sometimes necessary. Once again we see the irony of OCD. Those with obsessive-compulsive disorder strive to bring order, certainty, and safety to their world, yet the more they become a slave to OCD, the more the opposite happens. A good therapist can help those with OCD see the truth and encourage them to fight this tormenting illness with all their might. This entry was posted in Mental Health, OCD and tagged anger attacks, calling 911, causes of rage, creating a contract, fearing for safety, irony of OCD, panic mode. Bookmark the permalink. I used to get so anxious that I’d throw things, like the TV. When I was quite young. It was because of my OCD. I had no control over my emotions and always concerned with whatever my OCD thought was important. I can only relatively recently look back and realise this. After all this time! Thank you for sharing, Daniel! I think it’s probably true for many people that when they are going through these bouts of anger or rage, they don’t really understand where it is all coming from. And you bring up a great point – OCD was in charge, no matter what! Hope all is going well for you now and thanks again for your comment. It only happens every couple of months, but occasionally when my schedule is disrupted out of nowhere by other people or my own circumstances I panic to the point that I fly into a fit of rage and break important things around me. I rip up important papers of mine, expensive clothes, dump out toiletries, have broken a phone, slammed a laptop, etc. It’s not pretty. It’s like I just go in to overdrive panic over my prescribed schedule being ruined so I want to ruin everything else and create as much space around me as possible. Once I am left to pick up the wreckage I have created, I sink into a depression where I am paralyzed to do anything because I terrified of how OCD makes me a slave to its rigid rituals and yet I can’t do things any other way. I really hate this and am actually considering my therapist’s suggestion of going on medication to help manage my OCD. Does anyone have experience with medication helping curb their anger attacks? Hi Sophia, Thanks for sharing. You mention you have a therapist. Is he/she an OCD specialist who has successfully treated patients with ERP therapy? If not, you are not getting the right treatment for OCD. Medication can be helpful for some people, but in addition to ERP therapy, not instead of. I wish you all the best. Hi….I have been diagnosed with OCD and psychotic depression…i get angry at times. How should I deal with this habit? Is this due to OCD? Hi Samir, I am sorry to hear you’ve been having a rough time. I’m not a therapist so I can’t comment on your situation, but I strongly suggest you (and your wife) get the appropriate help for your OCD and whatever other issues you are dealing with. An OCD specialist should be able to help you sort this out and help you work toward beating your OCD. Good luck! You’re welcome. More attention needs to be paid to this very real illness! Yes thank you for highlighting PANDAS. What treatment do you suggest for treatment of OCD and rage when it seems related to PANDAS and inflammation? Will OCD therapy even help when it is medically induced? Hi Heather, That’s a great question and my guess is it would be a combination of therapy and medication used for PANDAS that would be helpful. However, I’m not a doctor. I hope you have a PANDAS specialist who can help you navigate this journey. I wish your family all the best and hope to hear from you again.